Why Are Government Weather Forecasts So Shouty? They’re one of the best products put out by the NWS. But they have A CERTAIN STYLE. PERHAPS AS THIS WEEK’S HISTORIC STORM HAS LOOMED OVER YOUR REGION … YOU’VE TURNED TO FORECAST DISCUSSIONS … LOOKING FOR WISDOM … CONTEXT … AND CLARITY. FORECAST DISCUSSIONS ARE ONE OF THE MOST HELPFUL TOOLS THAT THE NATIONAL WEATHER SERVICE PRODUCES. WRITTEN TWICE A DAY BY GOVERNMENT METEOROLOGISTS THEMSELVES … THEY SAY WHICH MEASUREMENTS ARE IMPORTANT AND WHICH MODELS TO TRUST. Which I will now stop mimicking. But for many weather-nerdy Americans, reading the forecast discussion has become part of the standard pre-storm prep routine. The discussions’ mix of chatty professionalism and meteorological arcana scratches a brain itch not that far from Drunk History. SINCE OUR RADAR IS STILL OPERABLE … I AM FAIRLY SURE THAT THE 343 MPH WIND GUST AT MILLINGTON IS AN ERROR. MY GUESS IS THAT IT IS OFF BY ABOUT 340 MPH. Wait, let me put that in terms they can understand. HELLO NWS … OBSERVE AMPLIFYING QUESTIONS FROM THE ATLANTIC … PLEASE ADDRESS WHY ARE YOU ALWAYS SHOUTING. When the government started requesting forecast discussions, they weren’t for public consumption. Rather, they were an internal communication tool between weather bureaus. Twice a day, along with the standard temperature and wind speed and pressure readings, meteorologists would add their professional annotation of the forecast. Maier’s old bureau, in Salt Lake City, was posting forecast discussions online by 1998, he said. At the time, local emergency managers asked for more expert analysis of weather data. So many different kinds of disasters could beset Utah—floods, wildfires, high winds, lake-effect snow—that they needed to know which predictions to take seriously. Handing them the forecast discussion was the easiest way to do that. But even as the discussions moved online, the old format persisted. The reasons were, and remain, stubbornly technical: Early teletype machines couldn’t transmit mixed-case letters, so all-caps became industry-standard. As recently as 2012, the World Meteorological Association required weather data to stick to the all-caps format. And even as the National Weather Service has updated its tornado-warning language in recent years, its had to stick to publishing all “products” in the all-caps style. Maier said that most meteorologists have become tired of shouting and are eager to move to a more modern format. But he said the National Weather Service still has to complete a formal review begun years ago in which it checked with all the users of its products—that is, “the military, other federal agencies, other state and local agencies, and a large component of the private sector”— to make sure they can handle mixed-case briefings. The worry isn’t that some tiny weather-obsessed shack in a remote corner of Alaska is still using a teletype machine, but that many different organizations automatically script certain responses to certain weather warnings. 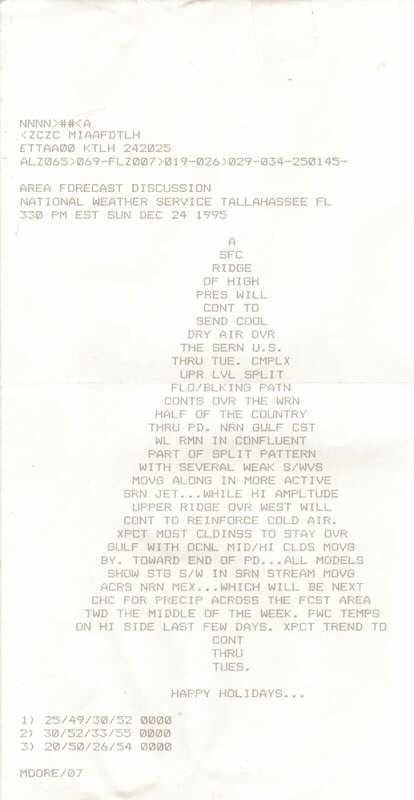 Will those ancient programs recognize weather data if it comes in looking like regular text? And what about those ellipses which litter every weather briefing? “In the old teletype system, you weren’t allowed to use commas. That’s your dramatic pause,” he said, laughing. Yet I wonder if, even after forecast discussions stop looking like E.E. Cummings at his angriest, that old constraint will persist. Earlier this week, I spoke to Paul Kocin, one of the weather service’s senior winter-weather experts. (He put out a forecast discussion on Tuesday that made its own inside joke.) I asked him why so many forecast discussions use dot-dot-dots so liberally. Why … do so many discussions … look like this?